Now that tax season is behind us, we hope you have a little extra time to spend with family and friends, focus on work and of course check out our latest improvement on the Procorem platform. We have heard you and continue to invest significantly in improving the capabilities of Procorem to support project workflow, external partner collaboration, document management, and much more! The core of Procorem is the ability to collaborate with users outside of your organization; such as partners, clients, and vendors. In order to ensure your data remains secure, you have asked for more granular security privileges to control your collaborators access and abilities within Procorem. That is what this release is all about! 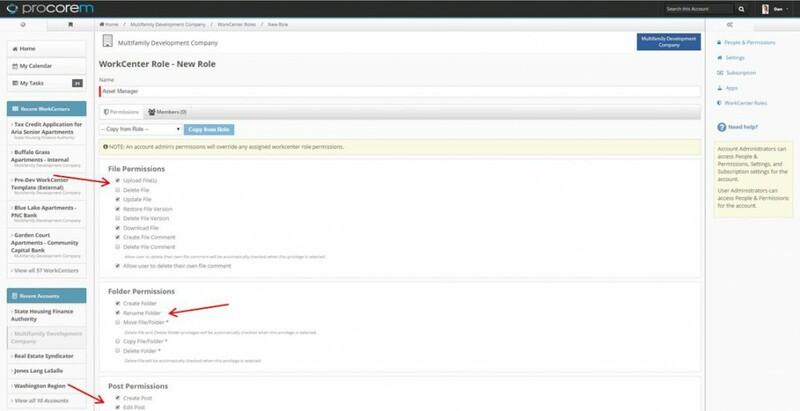 Configurable Security Roles will allow you to create your own security roles within Procorem. By picking and choosing from a list of permissions around files, folders, posts, tasks, and WorkCenters, account administrators can completely configure what their users can and can’t do in Procorem. For those of you managing your internal and external project through Procorem, you are no longer limited by the out-of-box security roles. Now you have the ability to completely customize and tailor security roles to fit your business needs. This feature will now provide you the freedom to control how information is uploaded, shared, distributed, and engaged with in Procorem. Whatever your business requires can now be easily and quickly delivered through Configurable Security Roles. First, log into Procorem and navigate to the account view page. Simply click on “Your Accounts” from the home screen and choose the one you would like to use. Once there click on the gear icon in the upper right of the screen and then select “WorkCenter Roles”. Once in the WorkCenter roles screen, you will see the standard WorkCenter roles that have already been created by the system. If you are curious on what those roles can do, click on the “Matrix” button on the right side of the screen. To add a new role, simply select the green “Add New Role” box on the left hand side of the screen. Now that you are ready to add a role, give your role a title (customize the role name so it is familiar to your users) and select the permissions you want to assign to this role. For this example we created the role of “Asset Manager.” Remember to scroll all the way down to see the full list of permissions you can assign. Then hit save. Heading back to your WorkCenter Roles screen, you will see that “Asset Manager” has been added as a new Configurable Security Role. With the right permissions, you can now change a user’s role directly within a WorkCenter. Simply drop down the Role dialogue box and choose the one best suited for this user on this WorkCenter. Alternatively, account admins can adjust user’s roles across multiple WorkCenters in the People & Permissions tab back in the Account View. With Configurable Security Roles the power and control for how your users use Procorem is completely in your hands. We continue to work with our clients on new Procorem capabilities and would love to hear from you! If you have a moment feel free to leave your comments below. For more how-tos, check out our FAQ. Procorem was built with the understanding that no matter the industry, business is conducted human-to-human—and our processes and tools ought to reflect it. © 2019 Procorem - Accelerate Your Outcome.